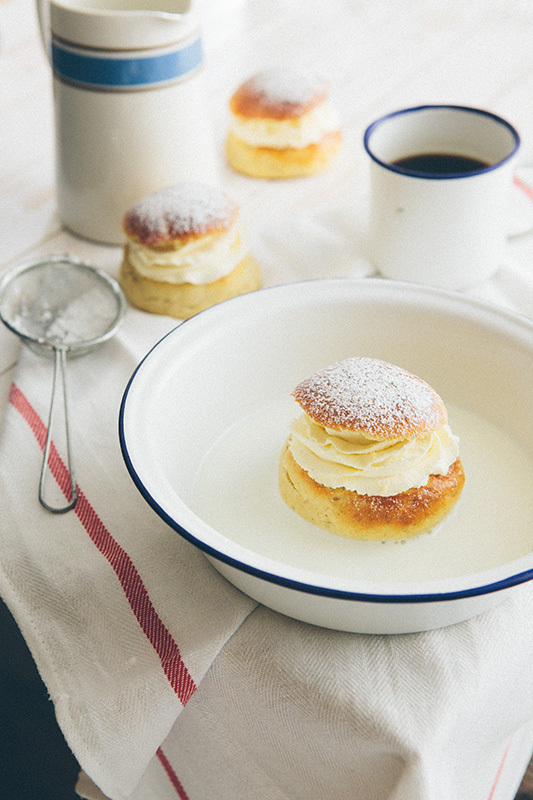 These cardamom yeasted buns are a unique treat for Sweden. They are one of the prettiest things that you can see lined up in a bakery window, all ready for Fika time. There are a few steps to making these buns, but if you plan it out correctly it’s fairly straight forward. I used fresh yeast for making these as I’ve actually never used it before and it seems more common for Scandinavians to use fresh instead of dried and I wanted to keep it fairly traditional. Next time, i’ll give it a go with dried yeast and see how it differs for taste and rise. If you would prefer to use dried yeast my rough estimation is that you could use 1 packet so about 6/7g for this recipe. These are something to enjoy with maybe a group of people with some strong coffee or fresh leaf tea. Too special for just a regular sweet snack. This recipe is adapted from the blog of Linda Lomelino one of my new fav blogs. Start by grinding some cardamom seeds using a pestle and mortar so that they become like dust and set aside. Crumble the fresh yeast into the bowl of a stand mixer and add milk, stir until yeast is completely dissolved. Add all of the other ingredients for dough except the butter. Work the dough using the dough hook for about 5 minutes, then add the butter a few pieces at a time. Work the dough for another 10-15 minutes or until it’s very soft and elasticy, there shouldn’t be any dough sticking to the sides of the bowl. Then, let the dough rest for about 10mins in the bowl. After the little rest, start forming little balls from the dough, each one should be about 70/80g. Carefully transfer the balls to a baking sheet covered with baking paper (remember to leave some space between buns). Cover with a cloth and leave to rise for at least 1 hour (preferably 1 1/2 hour). Preheat oven to 225°C (430F). Stir together the egg and water in a small bowl and lightly brush buns with egg wash. Pop into the oven and bake for about 10-13 minutes. They should turn a nice golden colour, place onto a wire rack to cool. For the almond filling: Mix 100g ground almonds with sugar and add as much water as needed to form a paste. Add vanilla, a splash of unwhipped cream and 25 g finely chopped toasted almonds to the paste and mix together until all is incorporated. Cream Filling: Whip the cream with some powdered sugar and vanilla until stiff (be careful not to overwhip) Pipe with a large star nozzle on top of the bun to create the traditional swirling cream look, then put the “lid” on top.Finish off with a dusting of some icing sugar. Give these balls of goodness a go, you won’t regret it. Yeah it’s really hard to get hold of in Ireland, I had to buy some off a local bakery. Yeah you can go as strong or as weak with the cardamom… i toned it down from the original cause i only like a small amount.